David Torn’s Prezens Quartet had top billing at the Walker last night, maybe because he is represented by a bigger label (ECM) or perhaps a bigger following among the young and electronically devout. Drew Gress’ Seven Black Butterflies ensemble was billed as the “opening” act, yet Gress has been at the top of jazz bass society for a decade and clearly provoked more audience response. The core members of Torn’s quartet (save the leader himself) are long-time associates of Gress and form 3/5 of Butterflies, yet the two ensembles reflect significantly different approaches to modern improvised music: one relying on human manipulation of sound, the other relying on human-induced feats of engineering, both dedicated to the creation and resolution of sonic experiments. That both ensembles reflect significant artistry is indisputable. Even on a dimly lit stage filled with laptops, pedals and circuitry, one recognizes collective, in-the-moment creation, interaction among musicians, improvisation that evolves as collaborative composition. Yet even with visual cues available, it was often hard to decipher the man from the machine as Torn’s quartet wormed its way through an extended “piece” filled with loops and loopholes, dirges and drones, surges and recessions, squawks and squeals, buzzes and pings. Sometimes it growled, mostly it spun on its own tilted axis, an ensemble floating through space more than hurtling out of orbit. Torn fiddled with the pilot’s controls, kept his feet dancing from one pedal to another, carrying the guitar as baggage as often as finding new ways to coax sounds directly from its strings. Taborn was on his feet as often as seated at the Rhodes, “bending circuits” on the control panel or maybe that was the “mellotron” box, his efforts often hard to isolate or identify in the mix. Berne and Rainey seemed less plugged in yet similarly creating from a well of Artificial Intelligence, the drummer providing graceful antics while Berne infused a bit of humor, muting his horn with a water bottle. Torn and company were undeniably interesting if not always aurally satisfying. Gress and Butterflies, on the other hand, were undeniably artful, spontaneous, and as satisfying as any ensemble I’ve heard at the Walker in recent years. Limited to acoustic devices, the quintet added muscle with a second horn (trumpeter Ralph Alessi), pulse with acoustic bass, and soul with acoustic piano. 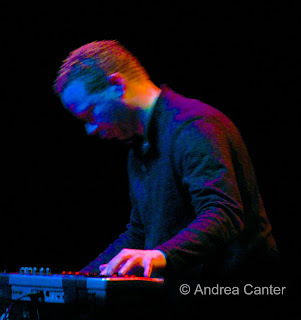 It was a rare opportunity to hear Craig Taborn in the role that brought him national attention 15 years ago as a member of James Carter’s early bands, and while his music has pushed farther and farther to the outside, his monsterous well of inventive and exquisite control of the keyboard remain. Taborn can stack thick chords like pancakes or dissect noodled passages into separate ingredients, then reassemble all into fragile glass chimes. While spontaneous combustion marked much of the too-short set, the four compositions offered variety in dynamics, rhythms and collaboration, at times as modal insurgencies and at other times as orchestral firestorms. The third selection (all unidentified) evolved as a call-and-response challenge of short tones among trumpet and bass as Gress and Alessi worked out at the respective tops of their instruments, yielding to a similar debate between Taborn and Rainey, then Berne and Rainey, the conversation trading dyads before the full quintet erupted. It was planned as the finale but the audience pushed for an encore. The stage was quickly turned into an electronics lab, with only fifteen minutes between the acoustic mayhem of Gress and the digital engineering of Torn. For the unplugged Berne and Rainey, it seemed like a short drive, yet for Taborn, the leap seemed cosmic, traveling across a sea to a parallel universe. It is in fact a transition he makes almost daily given the long list of bands on his current itinerary. Often his task is to move seamlessly between acoustic and electronic in the span of a few notes, and I have experienced sets where he sits with one hand on the Steinway and one hand on the Rhodes. I’ve always wondered how his brain is wired. 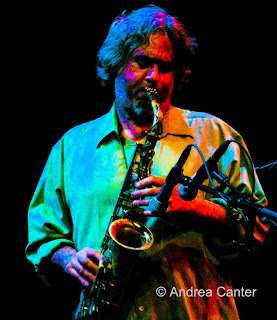 Modern jazz, or modern improvised music of whatever classification, requires exceptional flexibility in its musicians as acoustic boundaries are stretched like taffy, as more and more nonacoustic elements become part of the arsenal, and as its practitioners find themselves moving from one approach to another. And it also requires more flexibility on the part of the audience, particularly when two or more ensembles with divergent philosophies share the stage. For better or worse, the brains of the artists typically show greater elasticity than the brains on the other side of the stage. It makes for some challenging evenings, but that is the evolving nature of jazz. Fifty years ago, bebop was the avant garde. Photos: In the spirit of the music, Craig Taborn and Tim Berne at the Walker. Photos by Andrea Canter with a bit of modern engineering.